Samurai Shodown III: Blades of Blood, known as Samurai Spirits: Zankurō Musōken (サムライスピリッツ 斬紅郎無双剣, Samurai Supirittsu Zankurō Musōken?, the subtitle roughly translates to "Peerless Blade of Zankuro") in Japan, is the third game in SNK's popular Samurai Shodown series of fighting games for the NeoGeo. 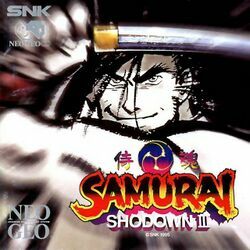 While it is the third game in the main series, it is the first part of a two-chapter interquel between Samurai Shodown and Samurai Shodown II. In keeping with their curious habit of using the third game in a series as a place to wipe the slate clean and start fresh, SS3 was to be the start of a bold new direction for the franchise. The most obvious difference between this game and the others in the series is the notably darker aesthetic. The "sillier" characters from the previous games have been excised, and even the kabuki master, Kyoshiro Senryo, received a bold redesign, transforming him from a flamboyant stage performer into a grim-faced, muscular man. All of the characters have been completely redrawn, and impressively so. The animation is surprisingly smooth for all characters. This page was last edited on 31 January 2018, at 18:01.